Sen. Jim Risch (R., Idaho) will preside over a hearing of the committee set for Wednesday that will examine how to adjust American foreign policies to address contentious issues toward China. They include Beijing's military expansion in the South China Sea, China's global Belt and Road Initiative infrastructure initiative, and its plan to corner key technology markets through the Made in China 2025 program. "One of the things is to properly calibrate or re-calibrate where we are in this relationship," Risch said in an interview. "It's good to take stock in something like that more often." The hearing will hear testimony from former senator James Talent, a member of the congressional U.S.-China Economic and Security Review Commission, and Oriana Skylar Mastro, a China expert and professor of security studies at Georgetown University. Talent has called China "the most serious threat" faced by the Pentagon and urged greater defense spending. Mastro has described China as a "stealth superpower" seeking regional dominance and the removal of the United States from Asia. The White House budget request made public this week calls for $780 billion in defense spending, including for new arms and systems needed to counter China. Risch said another goal of the committee's review of China policy will be to better educate the American public. Public attitudes toward China are hardening, according to a recent poll by Gallup. The poll found that Americans have the least positive view of China since 2012, with 41 percent holding a favorable view, a decline of 12 percent from last year. The shift may be the result of the Trump administration's more hardline policy toward Beijing and the president's willingness to pressure China on issues such as trade and militarization of disputed South China Sea islands. Risch said China's expansion in the South China Sea is a major concern for regional states that should be the subject of talks between Washington and Beijing. China has built up some 3,200 acres of islands in the disputed Spratlys and Paracels islands that are claimed by several regional states, including Philippines and Vietnam. Last April, Chinese military forces began deploying advanced anti-ship and anti-aircraft missiles on several islands. 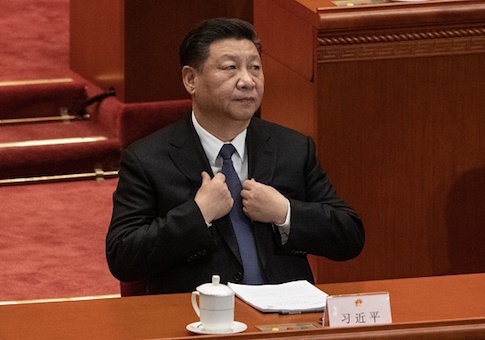 The United States has demanded China remove the missiles that can threaten both military and civilian ships and aircraft. "Nobody's been able to constrain China and that includes us," Risch said, adding that the United States will continue exercising freedom of navigation and overflight. "I think most everyone has seen the topography and what they've done—built the military bases they have built," he added. "It's going to have to be reconciled. There's no question about it. Obviously it's a great concern." Risch also said he plans to hear from experts on how the United States can challenge China's spread of its authoritarian political and economic model that allows Chinese businesses to compete unfairly by paying bribes to win contracts. In addition to promoting democracy and free markets, the United States needs to counter Chinese corruption. "It goes without saying that corruption has to be absent from that system," Risch said of the Chinese model. "Where a country or a business somewhere around the world puts up a contract or a bid, American companies are sometimes at a disadvantage because they, by law, are not permitted to—nor do they want to because of the culture we have—pay money under the table." Chinese businesses are operating without those constraints, he said. The United States needs to lead by example in showing how to follow rule of law and transparency policies, and "China really needs to do that," Risch said. In the House, Rep. Jim Banks (R., Ind.) introduced legislation on Tuesday that would restrict Chinese and other foreign businesses from stealing sensitive information from college campuses. The Protect Our Universities Act of 2019 would limit access to academic research from states like China, Russia, Iran, and North Korea. "Foundational research for key U.S. defense technologies lacks the proper safeguards at our institutions of higher education," Banks said in announcing the bill. "Countries like China may use subversive tactics to gain footholds in major STEM programs in U.S. universities to create a pipeline of data and information back to the mainland," he added. STEM is science, technology, engineering and math. China also is leveraging telecommunications companies like Huawei Technologies and ZTE in seeking entry points into U.S. data networks on and off university campuses. Banks said he has urged Education Secretary Betsy Devos to form a working group of high-ranking officials to address the problem. "The Department of Education’s lack of an adequate response to this request prompted me to craft legislation on the issue," he said. "We must get tough against these covert threats on college campuses and limit the effectiveness of their information-gathering missions. Clear-eyed vigilance is essential if America and our allies are to remain free from Beijing’s influence and espionage." The legislation would require students and researchers from nations considered threats—China, Russia, Iran, and North Korea—to seek waivers from the Director of National Intelligence (DNI) before being permitted to take part in sensitive research projects funded by the Pentagon, intelligence agencies, or the Energy Department. The bill also seeks to prohibit the use of technology developed by companies such as Huawei, ZTE, or Kaspersky Labs from being used in federally-funded sensitive research. "These companies have been linked to Chinese and Russian governments and raise concern throughout the intelligence community," according to a statement produced by Banks' office.